“Enter Africa” – Megagame-Workshop Gamify your City-Future! Can gaming and gamification enable new forms of participation? Are game mechanics a useful tool for designing future scenarios for our cities? This was to be found out on the Megagame-Workshop. The workshop is part of “Enter Africa”, a two-years project, which fosters analogue and digital game development in Sub-Saharan Africa. 15 Goethe-Instituts thereby empower young people to actively anticipate the transformation of African megacities in the context of globalization and digitalization as well as the consequences of this development for identities and cultures. 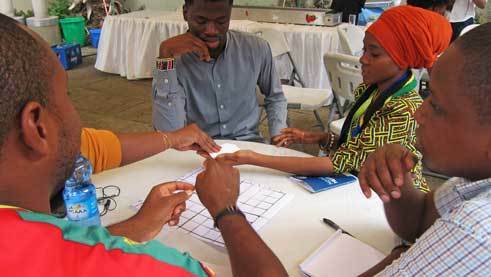 After each of the teams has created a location-based app game that deals with a specific challenge of their cities - supported by the two experience designers Bethlehem Anteneh and Dagmawi Bedilu – they have now come together for the first time to incorporate their visions and ideas in one game. Intercultural exchange and the search for common topics were particularly important during the workshop. 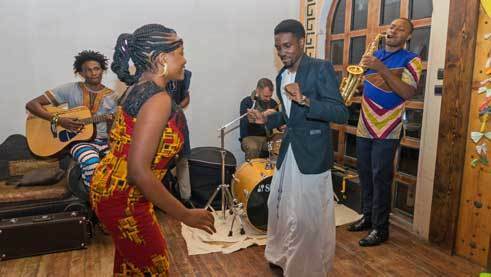 An international evening, which saw the newly founded “Enter Africa” band perform songs from all corners of the African continent, illustrated the diversity and commonalities of the participating countries. Other examples were objects, which participants brought to present their countries: In that context, different variants of a bean game came from Ghana, Rwanda and Uganda. Overlaps also exist between the topics of the location-based games: They address challenges, such as pollution and resource management, transportation and infrastructure, identity and cultural questions, but also innovation capacity and creativity of urban African youths. Finding connecting elements and a common ground between them through a democratic, participatory process was a crucial step in the creation of the megagame. At the same time, the participants were in contact with their teams at home to involve them in the decisions. What became obvious was how much the participants feel the urge to talk about and convey African issues in a positive way – which approach would be better-suited for this than a game that involves people from so many African countries in the development process? Towards the end of the workshop, the narrative structure of the megagame became more and more tangible: Fictional kingdoms trade with their resources. They open or enforce their borders and play out their specific powers in order to build strong cultures. Thereby, the players can find out, which forms of cooperation can lead to a livable and successful society. Valuable input on game mechanics came from Christoph Deeg, a gaming expert from Germany who has been part of the project for the last year. What represents randomness, what a strategic choice for the players? What are the incentives for collaboration or competition – or even sabotage? The ideas were transferred into a first prototype with the help of Steven Tu from South Africa, who has been chosen as the designer of the megagame, and who quickly created a first version of the board and cards. Now, apart from the location-based games, the megagame will be further developed so that it will be ready for launch at the A Maze Festival in Berlin as well as the Gamescom in Cologne in 2019. On top of that, the megagame and the 15 location-based games will be presented at different occasions across the African continent throughout the next year. Beyond that, the “Enter Africa” network shall grow together in the future. “I never felt more African”, said one of the participants during the workshop – summarizing what the initiators of the project wished for regarding ownership and participation. 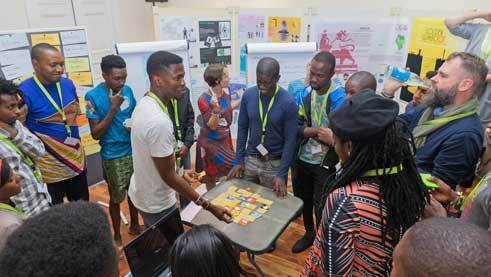 With “Enter Africa”, the Goethe-Institut provides information on analogue and digital game development in order to actively anticipate and plan transformation processes. Young teams of architects, urban planners, engineers, IT experts and cultural designers are thus developing ideas for their city in 15 major African cities. The various ideas finally lead to a transnational digital game about future scenarios of African cities. “Enter Africa” will be presented in August 2019 at the Gamescom in Cologne, the largest European games fair.